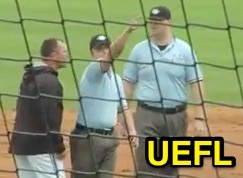 Offseason activity as Australian Baseball League 3B Umpire Riley Barrington ejected Sydney Blue Sox Manager Jason Pospishil for arguing a safe (out of the base path non-) call in the top of the 2nd inning of the Bite-Blue Sox game. With none out and two on, Bite batter Tom Brice hit a 1-1 fastball from Blue Sox pitcher Alex Balog on a fly ball to left fielder Alex Howe, who threw to 3B Joshua Dean as Bite baserunner R2 Jordan Cowan attempted to advance to third base on the sacrifice fly. Replays indicate Cowan jumped around Dean, but are inconclusive as to the timing of Dean's tag attempt relative to the distance Cowan deviated from his base path to third base, the call was irrecusable. At the time of the ejection, the Bite were leading, 3-0. The Bite ultimately won the contest, 6-3. Rule 5.09(b)(1) [pre-2015 Rule 7.08] states that a runner is out when, "He runs more than three feet away from his base path to avoid being tagged unless his action is to avoid interference with a fielder fielding a batted ball. A runner’s base path is established when the tag attempt occurs and is a straight line from the runner to the base he is attempting to reach safely."